Empowering investors of all experience levels to gain tools and knowledge to evaluate and acquire commercial & multifamily real estate investments. Advance from rental homes and move up to the big leagues of real estate investing. Network with other investors and professionals in the field. Jennifer is the President of BACOMM and Director of Marketing at Wilson Investment Properties, the sponsor company for BACOMM. Jennifer managed a product roadshows business for two years, where she developed herself in speaking to crowds and engaging at people. 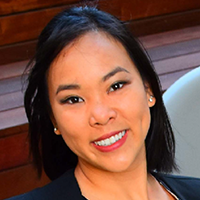 Since her first real estate investing seminar in early 2016, Jennifer is now an investor in commercial syndications and is always looking to give to those who want to learn. Jennifer received her BA from UCLA and her background is in fine art, art auctions, direct sales, and sales management. Tom K. Wilson is a 5 decade real estate investing veteran who has bought and sold over 4,000 units and over $450M of real estate in 6 states, including three condo conversion projects, 17 syndications, 8 multifamily, 13 commercial, and over 600 residential properties. After thirty years of managing some of the Silicon Valley’s pioneering technology companies, Mr. Wilson put his business and management experience toward fulltime investing. Mr. Wilson is the weekly host ofthe Real Estate Radio POWER investing radio program on KDOW 1220 am every Wednesday at 2 pm PST and is a popular speaker on real estate investing. 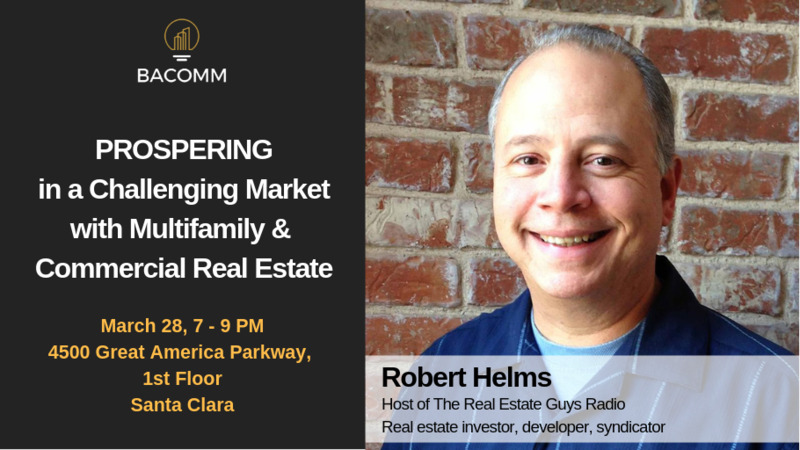 Robert Helms is a professional real estate investor with investment and development experience in nine states and six counties. As a former top producing real estate agent, Robert ranked in the top 1% of sales in the world’s largest real estate organization. 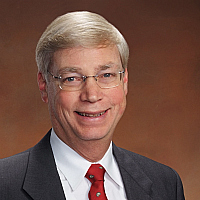 For 4 years, he taught Real Estate Practices & Appraisal at the college level. Robert’s investment and development companies have past and current projects valued at over $800 Million. He is the co-author of Equity Happens – Building Lifelong Wealth with Real Estate and the host of the nationally syndicated radio show The Real Estate Guys™, now in its twenty-second year of broadcast. The podcast version of the show is one of the most downloaded podcasts on real estate and is heard in more than 190 countries. Snacks and beverages will be provided, and this event is free of charge. Guests are welcome to attend. Visit www.bacomm.club/resources to access previous meeting slides and recordings. STOP OVERPAYING ON TAXES! Discover surprising ways to keep your wealth! 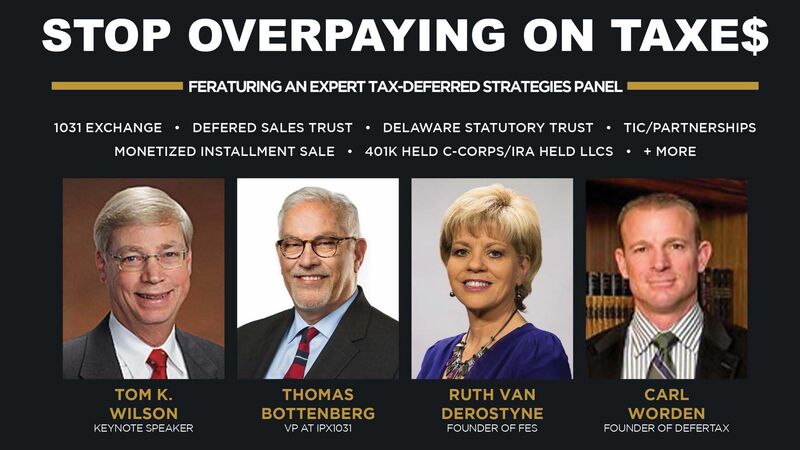 We are excited to bring together experts across a wide range of tax-deferred strategies in ONE PLACE to educate YOU on how you can keep more of your hard earned wealth! - A comprehensive overview to the multiple strategies you can apply to reducing, deferring, or eliminating your taxes when making investments! Tom K. Wilson is a 5 decade real estate investing veteran who has bought and sold over 4,000 units and over $500M of real estate in 6 states, including three condo conversion projects, 20 commercial & multifamily syndications, and over 650 residential properties. After thirty years of managing some of the Silicon Valley’s pioneering technology companies, Mr. Wilson put his business and management experience toward full time investing. Thomas Bottenberg is IPX1031's Northern California Manager and has been actively involved in the 1031 exchange industry for almost 30 years, having completed over 40,000 1031 exchanges. Starting with a tax law firm in Oakland, California, Tom developed a continuing education curriculum for real estate brokers and routinely spoke to 6-8,000 brokers and investors monthly. Tom will also be covering other strategies, such as Deleware Statutory Trust, NNN, TIC, and more! Ruth Van Derostyne is a credit counselor and capital gains tax strategist with over 25 years of 1031 exchange experience. She is a frequent educator and speaker, and was the President of two different Companies. Ruth will be representing the Monetized Installmend Sale strategy, which can be used for investments across multiple asset types, as well as primary residences. Carl Worden consults for tax deferral options for primary residences, secondary residences, investment properties, stock and other highly appreciated assets. Carl and his team have been leading workshops with top CPAs, trust attorneys, and tax attorneys across the country for the past 2 decades, helping thousands of people from all walks to life defer taxes on the sale of their assets, and educating thousands of real estate agents, title companies, and lenders to provide options to their clients. Carl is a financial advisor, real estate investor, real estatea agent, and 1031 exchange consultant. Carl will be representing the Deferred Sales Trust strategy along with many others. Appetizers, wine, and beverages will be provided. Admission $40. Parking in the structure across the street is free of charge after 6PM. Vinney "Smiles" Chopra, a mechanical engineer, RE broker and a motivational speaker came to the US from India with $7 in his pocket. He sold encyclopedias and bibles door-to-door as a student. His hard work paid off when he graduated from George Washington University with an M.B.A. (In Marketing). He realized then that he would make his career in “Relationship Building and Networking” field. 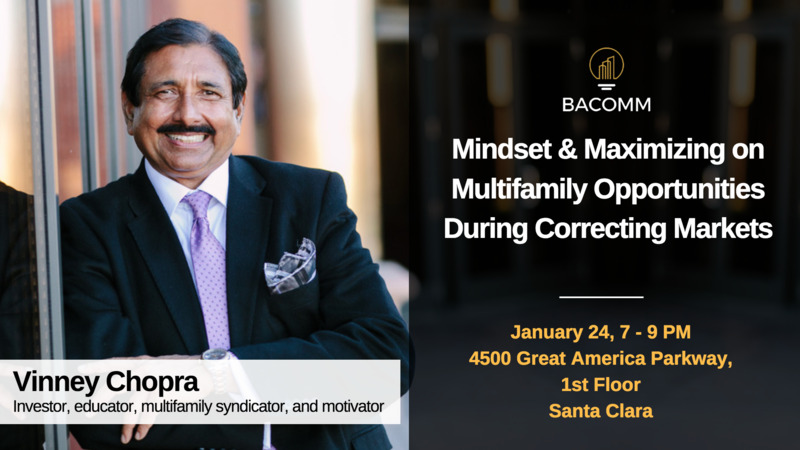 As a multifamily syndication expert, he has facilitated over 26 successful syndication deals and has acquired and manages a very successful real estate investment portfolio worth over $200 million. Vinney has been a professional Fundraising Consultant and Motivational Speaker for over 35 years. He has given over 10,000 exciting speeches and seminars on Fundraising, Positive Thinking, Enthusiasm, Goal Setting, Balanced Living, and has been involved in Business Coaching. - The surprising multifamily opportunities there are RIGHT NOW even in California!